Grace Church is a proud supporter of Welch College, the flagship school of our denomination. The college is located in Nashville, Tennessee. Vertical Three is a national ministry partner through Randall House that facilitates our work in equipping youth to learn the Scriptures and use their gifts in music, drama, and the arts for the edification of the local church. At home, we simply call this 'CTS'--Church Training Service. Grace Church orders most of its curriculum and biblical literature supplies from Randall House Publications, the publishing arm of the National Association of Free Will Baptists. Grace Church is a part of the National Association of Free Will Baptists, whose headquarters is located in Antioch, Tennessee. Free Will Baptist local churches are autonomous religious bodies who voluntarily cooperate with the larger Free Will Baptist movement for the cause of Christ. 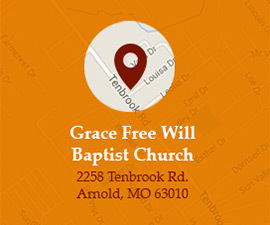 Grace Church belongs to the St. Louis District Association, which belongs to the Missouri State Association of Free Will Baptists. Camp Niangua is our Free Will Baptist state youth camp which we have sent our youth to for years. We are proud supporters of their ministry.